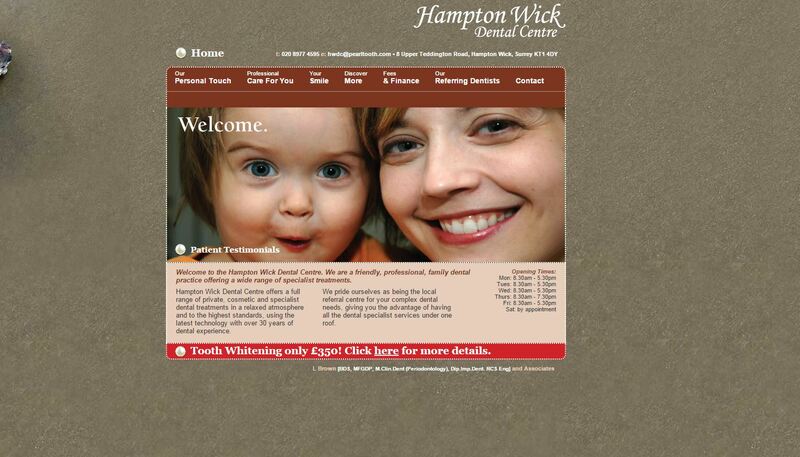 The Hampton Wick Dental Centre site is one of our earliest web design examples. Originally on a different and less user-friendly content management system, we recently moved the site on to WordPress to give our client more flexibility and allow them to update and add new content, when necessary. Although fairly uncomplicated in style, this fairly large site incorporates video embeds, animation and special forms for patients. With their existing domain name, pearltooth.com, Hampton Wick Dental Centre were looking to make pearls and their association with white, shiny teeth prominent within the design. Pearls features throughout the design – in the logo, within an oyster on the sandy beach background image on the homepage and as a bullet point to highlight important links throughout the site.